I'm taking a little technology break (unless it's for work) so I will be posting lightly for a while. In the meantime, I'll be hanging out in the garden with Flora, my new garden friend. Does the oil spill anger U? Will you volunteer to aid the clean up? Does the name Flora have anything to do with the book "The Bridesmaid"? Flora looks like a nice friend to spend some quiet time with (except when thinking about what Jenn wrote and then she gets real creepy!). Please please tell me that she is NOT made of "resin". Or better of course, "Designer Resin". Both are euphemisms specifically designed to hide the fact that they are PLASTIC. Made, of course, from oil; Satan's crack cocaine. "Does the oil spill anger U? Will you volunteer to aid the clean up?" I would assume by "clean up" you mean rounding up BP execs for transport to Guantánamo? I don't know what the hell you all are talking about, but Flora is the Roman Goddess of Flowers. Greenpa - Flora is made out of butter. Each day I pour a new mold and put her in the chest freezer overnight. Technology Break? Can you do that??? You're taking a tech break because you shaved off all of your hair and sent it to clean up the oil spell, right? Oh wait that was me. Never mind. You have sunflowers in your garden already? Damn! My garden is challenged so far. This weekend (eighty plus) should help, though. 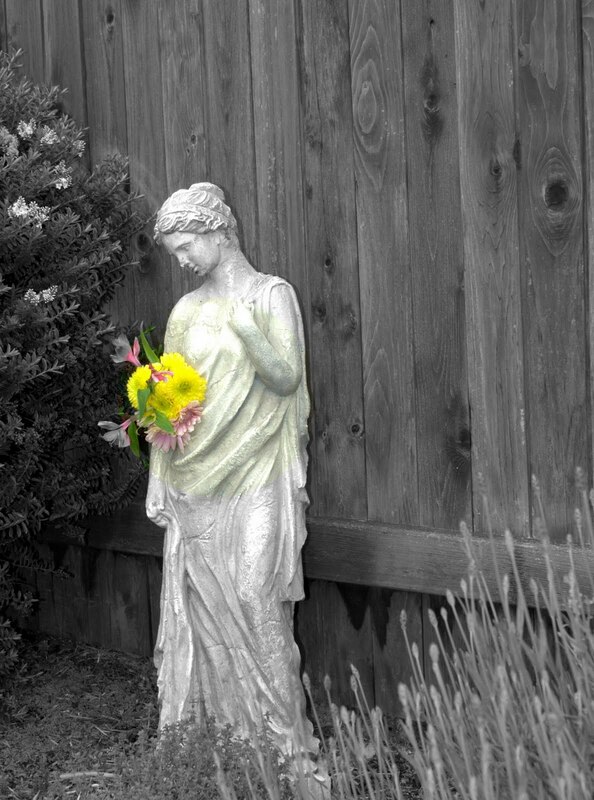 For what it's worth, it would never cross my mind that you might have plastic statuary in your garden, or anywhere else, for that matter. If the oil was on our coast I probably would volunteer to help with the cleanup. However, since I live several thousand miles away from the affected areas, it seems like the carbon footprint from getting there might offset my contribution. I think I will write to my Congressmen instead urging them to pass meaningful legislation to prevent such things from happening in the future. No, Dale, we don't have sunflowers in our garden. Those were from a bouquet that was on its last legs. And, yes, like many things in our lives, resin is sometimes the chosen option. Like the keyboard you are typing on and the computer you are using. Concrete statues have the issue that concrete manufacturing is highly environmentally unfriendly and I don't have the $ (or back) for hand carved stone. Plus, I figure the anti-depressant benefits I get from Flora has a lot less impact than pharmaceuticals. Oh, BTW, I have volunteered to wash birdies during an oil spill in the 90s. Although I think my husband ended up doing more of the hands-on stuff and I helped out with other clean-up action (since he had previous animal handling experience from working in a lab - they aren't likely to let you work with animals otherwise). Deanna, you are a good woman.